Death to the Red Beards! FEAR gripped the Flat Head people after Og returned from his long scouting expedition to the Red Beard village and told his story. The council broke up swiftly. Muttering among themselves, the men of Big Tooth's village hurried to their caves, there to look to their bows and arrows and stone axes, and the safety of their families, for they knew now beyond a doubt that due to the treachery of Pong, their former witch doctor, the Red Beards were going to attack their village. The barbarians from the north intended to invade their peaceful valley, steal their growing flocks, appropriate their gardens, perhaps even take possession of their caves, killing their strongest warriors and holding the weaker as slaves. It was a plan evolved by the crooked brain of Pong, the witch doctor, for the Red Beards. Og said so, and Og knew, for he had been spying on the Red Beard village for many suns. Big Tooth and Ru and Tao were worried, and when the Flat Head men had left the council rock and gone to their caves, the three of them persuaded Og to come up to the ledge before Big Tooth's cave, and there around their cooking fire, while they roasted a haunch of goat meat, they asked for his story again and plied him with questions. "Whoo! Tell 'um from beginning again, Og," said Big Tooth, after he had helped Tao revive the fire and spit the goat meat over the flames. "Tell all this thing about Pong and the Red Beards. Tell 'um slow so can understand everything." "Aye," said Ru. "we would like to hear it all again now when there are not so many people, so we can think better." "I will tell it again. Then while the goat meat is cooking we will all do some hard thinking, and it will have to be good thinking too, to keep that pack of red-bearded wolves from stealing these caves the Flat Heads call home, for they are coming to attack us and Pong will show them the way into our valley." Og sat down with his back against a rock and for a moment seemed to brood in silence before he started talking again. "You remember," he said finally, "we found where the Red Beards had set upon Pong, in the jungle by the Kai bush and beaten him because his charm had failed to stop the woolly rhinoceros from attacking the Red Beards who were stealing our mussels." "Aye, but the charm failed only because of Tao's good thinking," said Ru. "THE Red Beards did not know that," replied Og, "so they beat Pong, thinking that he had tricked them. They would have killed him only the old cheater begged for his life and promised he would show them a safe way into our village. I found that out, when I followed the trail of the Red Beards back to their village of strange stone huts up in the country where the glaciers grind and grumble. There one whole dark time I crouched outside of old chief Lost Ear's strange stone house and listened while the Red Beards held council with Pong, their prisoner. Old Lost Ear and his clan are seeking a new home. Their country grows too cold because of the glaciers that move down from the north and there are no caves there for them to dwell in. They have had their eyes on this valley for a long time. That is why there have been so many in our forest. But they know we have strong bows and long arrows. They know there is but one pass by which to get into our valley and they know that pass is watched and guarded by a great pitfall and so they have been afraid to attack us with only their slings and stone axes. "Pong knew all this, as we knew it. He has been dealing with our enemies the Red Beards for a long time. You remember we heard him tell Lost Ear that if his charm against the rhinoceros worked he would come to their village and be their medicine man. It was what he hoped to do and when his charm failed his quick tongue must have saved him. In the council in Lost Ear's hut he told the Red Beards how our pass was guarded; how there was a deep pitfall craftily covered over into which the mammoth had plunged, and into which the Red Beards would also plunge if they attacked from that direction. Then he told them of the narrow trail up over the mountains and into our valley from the east; the trail that is never guarded because it is too narrow and too steep for the mammoth or the other great creatures to travel. It is by that trail he would lead them into our valley; by that trail and some of his trickery." "Whoo. What be this trick him play on us, huh, Og?" queried Big Tooth, blinking seriously at the cave boy. Pong would lead most of the Red Beards to the lower pass where they would appear to get ready to attack us and fight their way into our valley. But that would only be a trick. While the Red Beards made a great noise at the pass and threw many sling stones at our warriors who would be crouched on the far side of the covered pitfall they would never venture to a real attack and meanwhile Pong would lead Lost Ear and a band of their strongest warriors up to the pass over the mountain yonder and slip into our valley unwatched to set upon our men from behind. All this I heard Pong and Lost Ear plan as I crouched outside of Lost Ear's stone hut. And when I knew all of Pong's treachery I hastened southward again, traveling the game trails in darkness and sunlight until this day I got back to our village." "Og, must be very tired," said Tao, glancing at the haggard face of the cave boy. "And hungry, too," suggested Ru. "I am both," said Og. "But worse than that my brain is troubled with much thinking of how to outmatch this trickery of Pong, and save the valley of the Flat Heads from the Red Beards." "Whoo! Maybeso be better for put most of our men to watch mountain trail, and not so many in pass to fight off Red Beards, huh, Og?" suggested Big Tooth, scratching his head after such thoughtful effort. I DO not know," admitted Og. "I have thought of that Big Tooth. But Pong is shrewd, and Lost Ear is a quick thinker. If they see the pass is not well guarded they will guess that most of our men are up watching the mountain trail, and so they will really attack at the pass where most of their men will be. They will swing over the pitfall on vines or climb across on bamboo poles and swarm into our valley there. Remember, Big Tooth, there are many more Red Beards than there are Flat Heads." "Whoo! What can do then, Og, to save our people?" queried Big Tooth, deeply worried. Again Og was silent while Big Tooth and Tao and Ru watched him anxiously. "Bah," cried Ru, contemptuously, "They would climb over them." Og's brow was puckered with many furrows indicating the effort his thinking caused him. But suddenly a smile broke across his face and an exclamation leaped to his lips. "Hi-yah!" he cried, "I have it now! Tao, where is the great net; the one we trapped the giant crocodile in?" "It and many other nets are down in the cave by the river. The fishermen use them often now," replied Tao, surprised. "Good," said Og. "I believe we can use them. We will go and look at them after we have eaten." "Whoo! Whoo!" said Big Tooth, completely puzzled. "Og not think we ketch 'um Red Beards in nets, huh?" "Nay. I have better thoughts than that, Big Tooth. But come, the goat meat is roasted. Let us eat, for there will be much work for all of us to do after we are finished with our meal, and I do not believe it will be many suns before the Red Beards are upon us." By the time the sun had reached mid-heaven that day the Flat Head village was a hive of activity. At Og's suggestion Big Tooth called all his strongest bowmen and best spearsmen together and took them to the lower pass; there to conceal better the great pitfall, they cut the vines by which Red Beards might swing over the pit, and built wattled barriers of thorn bush through which the Red Beards would have to fight their way if they did manage to cross the pit and behind which the Flat Head bowmen would crouch while they sped arrows at the invaders. Big Tooth also sent some of his most trusted warriors like Strongarm, Crooked Leg, and Long Finger into the jungle to watch for the coming of the Red Beards and give the hyena call of warning when they had sighted them. But Big Tooth did not hold all his strong men at the lower pass. As many as he had fingers on either hand he bade join Og and Ru and Tao to help them in building the defenses of the high pass through which the narrow trail came over the mountain. First Og instructed these men to get all the fish nets at the river. These they carried up the winding trail toward the top of the mountain where the trail came through between two towering cliffs that flanked each other. "Og, this pass can be held by a few men. It is a fine place to drop rocks from as I rolled down that boulder onto the cave tiger." Og smiled grimly and nodded. "It was remembering that good thinking of yours, and your thinking about the nets that made me know that we could hold this pass against the Red Beards." "But the nets, Og; what have they to do with this?" queried Tao. "They will let us drop many stones on the Red Beards instead of just a few. Look you. Here are my thoughts. Among these ledges on both sides of the trail we will build what I would call cribs of stone. We will lash the nets to logs and to stakes jammed into cracks in the rocks. We will lash them so that they will bulge out over the trail when they are filled with rocks. Then we will pile these cribs with stones until they are ready to spill over and we will station men at each net with stone axes. These nets will be lashed so that by cutting two big strands of bark rope on either end with quick blows the nets will let go and hurl all their stones down into that canyon below us and"
"Ho! And if that trail is jammed with Red Beards then, Og, what a slaughter there will be. This is good thinking, Og." "Aye, I believe it is, Tao," said Og, a little proudly. "Few of the Red Beards who come up this trail will get into the valley of the Flat Heads. I hope that Pong and old Lost Ear himself will be the leaders of this band of attackers." "Hah! They will be wiped out. Never will Big Tooth's people have any more trouble with those savages from the North." "Nor will our own Cave People be troubled by them again either, for I do not believe there will be many left," said Og, confidently. Then he added, "But come. There is much to be done and little time to do it in. Call Ru and those Flat Head fellows to come up here. Tell them to hurry for we may not have much time to do our work in." BUT Og found that he had time to build up his defenses of the big pass for the hyena calls of warning from Big Tooth's scouts in the jungle did not sound that day nor yet the next day, and meanwhile he and Tao and Ru, with the Flat Heads Big Tooth had sent with them, worked feverishly building their cribs of bark netting and stakes. 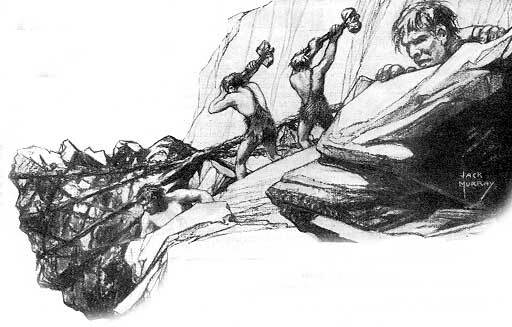 Indeed they worked so hard that by sundown of the first day, one great crib had been constructed on either side of the high pass and filled with stones until the netting bulged and the stakes creaked and groaned and threatened to give way under the sheer weight of the mass of rocks they held back. With these two finished Og breathed a sigh of relief for he knew that the pass was now partly protected. But he did not cease his labors nor did he let the Flat Heads loaf. With words of warning and encouragement he drove them to building more rock cribs on both sides and deeper into the pass until there were bulging nets filled with rocks almost the entire length of the pass. Only then did he let his men rest from their efforts of rock piling, and only then did he rest himself. Darkness of the second night was coming on when the last crib was completed and the entire party gathered on a ledge on the valley side of the pass, there to huddle together during the night hours. Og knew that the Red Beards, fearing the darkness, were not likely to attack after sundown, yet he would allow no fires on the ledge, and he and his men had to eat meat that was cooked by the women at the cook fires before the caves down in the valley and carried up to them. Without the shelter of a cave or the warmth of a fire, or even bed skins to protect them, the defenders of the upper pass huddled in a compact mass on the ledge, sharing their bodily warmth as they slept. But Og and Tao and Ru slept less than the rest, for during the night hours one or the other of them woke often to listen intently for any signal to say that the marauders from the North were abroad. With the dawn of the third day that signal came. Even as the first streak of lurid red splashed the eastern sky, and while yet the blackness of night hung low across the west, from far off in the jungle below them and beyond the valley, came the long, sinister howling call of a hyena. Once, twice it sounded. Then it was taken up by another and still another scout, and Og knew that Strongarm and the other men that Big Tooth had sent into the jungle had discovered their enemy coming down the game trails toward the valley of the Flat Heads. Quickly he mustered his little force of defenders and saw to it that they all were armed with their stone axes. Then he spoke. "Every man to his place. You know where your places are. Stand ready with your stone axes so that with quick blows you can cut the ropes of bark and send the stones crashing down into the canyon. Look to me for the signal. I will crouch here on this ledge, watching. When I think all the Red Beards are in the canyon I will wave my arm thus. Then strike at the ropes quick and hard. But let none strike before I give the signal or the plan may be spoiled. We must trap Pong the cheater, and Lost Ear the Red Beard chief and as many Red Beards as we can. To your places now and every man ready, for we know not how soon those Red Beards may climb up here." All the Flat Heads hurried to their posts and with axes ready crouched beside the guy ropes, waiting. And on the ledge waited Og, with Tao and Ru at the first crib not far distant. FROM the jungle the hyena calls were echoing frequently now, indicating that Strongarm and his scouts were still beyond the lower pass, watching the advance of the enemy and signalling to the defenders as Lost Ear's men approached the valley. Soon the hooting of the Flat Heads was added to the signal calls and the guttural shouts of the Red Beards and Og knew that the first of Lost Ear's men had arrived at the lower pass and had driven the scouts back into the valley to take up their stand with the defenders. A veritable din was raised then that echoed up to the summit of the mountain and caused Og and Tao, with Ru and the rest of the defenders of the upper pass no little anxiety. Indeed it sounded as if a terrific battle was being waged down there with all the strength of the Red Beards thrown against Big Tooth's men, and for a time Og feared that he had made a grave mistake and weakened Big Tooth's forces by taking men away to defend the steep and little used pass high up in the mountains. Ru had the same feeling and as he listened to the sounds of battle he looked at Og with distress. "Something has gone wrong, Og," he said in a tense half whisper, "The Red Beards are fighting their way into the valley down there and we are up here where we cannot lend Big Tooth any help. This is very bad. I am worried." "I am, too," admitted Og. "But, Ru, as they battle down there these Red Beards do not seem to make their way in through the lower pass. From here you can still see Flat Heads crouched behind their hedges of thorn bush hurling spears and arrows." "They are giving Lost Ear's men a stout battle. Maybe we had better go down there and join Big Tooth besides we are missing much good fighting. I like not to be left out of good fight," said Ru, a little anxiously. "Aye. Nor do I. And Big Tooth will need us, too. Maybe we had better go down"
But a sharp, sibilant hiss interrupted Og and turning he saw Tao waving his arms and pointing. "The Red Beards are coming up the trail. Look yonder." "Hi-yah! They are," exclaimed Og "And Pong and Lost Ear lead them." "Ho-ho!" said Ru, "Nearly those fellows fooled us. Almost I was read to leave here and go down to help out Big Tooth. They have been a long time getting up here to the pass, Og. "Aye. The trail is steep on the other side. But they are here now. Look at the mass of them as they crowd into the canyon." "They hear the sound of battle. See how Lost Ear stops to listen. Now he beckons his men onward. They are coming into the pass." "Aye. Like a pack of wolves with the kill in sight they come. They are in a hurry," he said grimly. "Hah! In a hurry to go to their death," hissed Ru. Og nodded. Then he whispered. "Back to your post, Ru. Do not make a sound. They are coming into our trap with never a thought of danger." So they were. Lost Ear could catch the sound of battle at the lower pass and he realized that he and his men were late. But be also realized that the Red Beard attackers down there were holding the attention of Big Tooth and, as he supposed, all the Flat Head fighters; and so with an evil smile on his face he hurried forward, the scrawny figure of Pong trotting along beside him and a. veritable horde of Red Beards crowding into the pass in his wake. 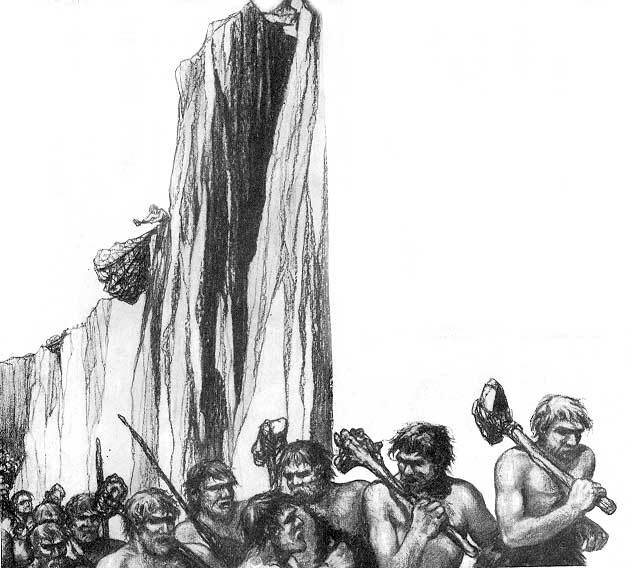 None had the remotest suspicion that death literally hung above their heads. Into the narrow canyon they surged while Og crouched on the ledge watching them. For a moment he was conscience stricken as he saw with what little thought they were crowding into the trap he had set for them. But when he realized that their thoughts were all on how stealthily they were going to slip down into the valley of the Flat Heads to kill the women and children of Big Tooth's clan in their caves while the men fought valiantly at the pass, flames of anger burned away qualms of conscience and he crouched lower as the Red Beards crowded into the narrow canyon. Forward they came beyond the first bulging rock crib and the second. Beyond the third and the fourth they advanced. 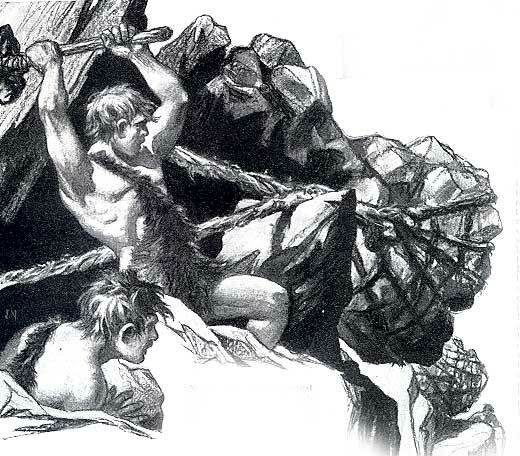 The narrow declivity was jammed with them, and Og saw that all of them were armed with great stone axes or slings. He was tense and eager. So were all his men. A quick glance from where he stood showed him every Flat Head with stone axe upraised ready with a quick stroke to cut the lashing of the rock crib as soon as he gave the signal. Should he give that signal now! A moment he hesitated, wondering. Then he leaned forward on the ledge where he crouched to determine just how crowded the canyon was. But as he did so his hand touched a rock that lay perilously close to the edge and before he realized it the stone, larger around than his two fists, tumbled over and in a shower of gravel went hurtling downward. Og caught his breath. That stone would warn the Red Beards. When it crashed against the rocks down there every face would be turned upward and in an instant they would know what a death trap they had blundered into and would turn to flee the canyon. Indeed, even as the thought flashed through Og's mind, the falling stone hit with a sharp rap against a projecting rock, bounced across the pass and striking the rock wall there rebounded to go rattling clown to the bottom. Instantly Lost Ear and Pong stopped and every face turned upward as Og had expected. For a moment the mass of Red Beards stood rooted to the spot as they beheld the great netting slings of rocks that hung above them. Then as they realized what they meant they turned and with wild yells of alarm started back out of the canyon. Og never gave the signal to release the avalanche of rocks that followed. Indeed, no one gave it. With the yells of the Red Beards rising to them the tensed Flat Head axemen who crouched beside the taut guy ropes of the rock cribs realized that the Red Beards were escaping and instantly they began hacking furiously at the ropes. Some parted quickly. Others required a little more cutting, but presently a thunderous roar of falling rocks started; it grew and grew in intensity as more and more of the cribs gave way and dropped their loads of deadly missiles on the mass of Red Beards who were fighting each other savagely to get out of the pass. And with the beginning of that tumult in the high pass on the mountain Big Tooth's men at the lower pass, realizing that many of the Red Beards had been wiped out by Og's strategy, burst into a cheer and, darting out from behind their barrier of thorn bushes, hurled a tornado of arrows into the ranks of the Red Beards opposing them and drove them back into the forest. It was all over quickly, so quickly fact that the sudden silence that settled down in the pass as the rattle of the last rock died away seemed to surprise everyone including Og himself. 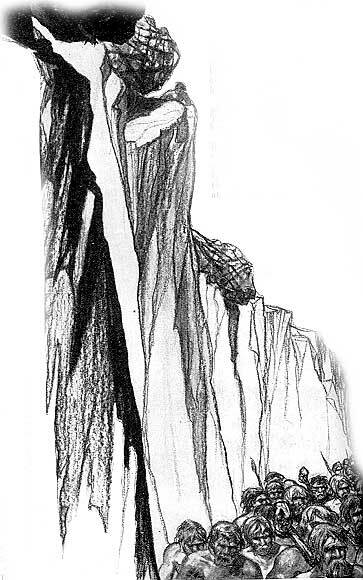 For a long time he stood up there on the cliffs with Tao and Ru and the Flat Heads peering over into the pass. Then slowly they climbed down. But they did not go into the pass. They knew that there were many dead Red Beards down there and that Lost Ear and Pong, the cheater, were probably among them, and none wanted to see the horror of their handiwork, Og least of all. Somehow he found happiness in the knowledge that the stone he had accidentally knocked over the edge had saved the lives of a great many Red Beards who had managed to get clear of the pass and who, without the savage leadership of Lost Ear or Pong, the witch doctor, would probably never return to harry the Flat Heads or the Cave People.